If you watched Game Of Thrones and spent time on the internet this summer, you might have seen a few tweets directed at Bran Stark, whose personal reinventions as the Three-Eyed Raven came off to some like a Westerosi Jaden Smith. What that generally means is vague, incoherent, freshman Philosophy 101-speak that can be construed as otherworldly wisdom. Smith has cultivated this type of persona into an internet phenomenon—notice how he capitalizes every word in cryptic tweets for his six million followers (for example: “The More Time You Spend Awake The More Time You Spend Asleep”). In theory, Smith’s antics, with the right touch of self-awareness, would be a hilarious concept for a TV show. And an anime grants even more freedom and experimentation versus a live-action series. 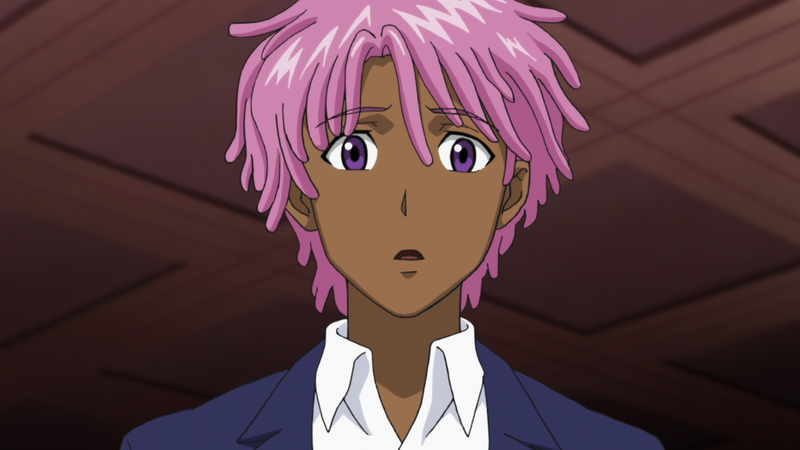 So why is Neo Yokio such a disappointment? The new Netflix anime, created by Vampire Weekend frontman Ezra Koenig, puts Smith front and center as the eccentric, pink-haired Kaz Kaan. Kaz lives in the seemingly thriving metropolis of Neo Yokio—a combination of New York and Tokyo with futuristic flourishes like an underwater neighborhood at 14th street and mecha-butlers to serve the wealthy elite. Kaz is among the privileged few in Neo Yokio, but he has to work for his status as a member of the “magistocracy,” citizens from a lineage of demon slayers who perform frequent exorcisms, since demons are attracted to the city. Kaz is hired for these assignments by his Aunt Agatha (Susan Sarandon), but he’d rather spend time with his buddies Lexy and Gottlieb (Desus & Mero) concocting new cocktails and being tended to by his robo-butler, Charles (Jude Law, impeccable as always). For Kaz, the demons aren’t nearly as worrisome as his status on Neo Yokio’s most eligible bachelor board—literally mounted in the center of the city’s version of Times Square with real-time updates—and besting his arch nemesis, Arcangelo (Jason Schwartzman), in the rankings. 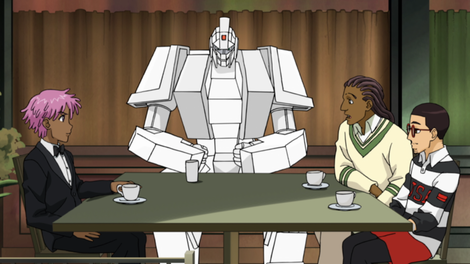 Neo Yokio understands that the tribulations of Kaz and other members of high society aren’t exactly paramount. An entire episode is spent with Kaz freaking out over the fact that the tuxedo he’s supposed to wear for a black-and-white gala is, in fact, midnight blue. The show is occasionally quite funny, especially when Kaz throws out some signature Jadenisms—some of the best include “Who cares what time it is when the future’s an interminable abyss of wackness” and “My existential dread is acting up today.” But for the satire to be effective, and for Kaz to be more than an amalgamation of Smith’s most beguiling quirks, the character needs an actual arc, something to acknowledge that Kaz is at least a better version of the vapid, self-centered demon slayer we meet at the onset. In the six-episode first season, there are perhaps 45 total seconds of introspection from Kaz, where he considers that Neo Yokio might not be the best city in the world for all of its residents. And this is after repeated, unsubtle nudges from former-fashion-blogger-turned-woke-anti-Neo Yokian Helena St. Tessero (fashion writer and actor Tavi Gevinson, in a clever bit of casting). It’s not exactly a healthy ratio. That isn’t to suggest half of the anime has to be critiquing and analyzing class struggle for a futuristic version of New York, but without enough character development, Neo Yokio is luxuriating in its own capitalist satire by repeatedly focusing on the lavish excess afforded to Kaz and his peers. Who needs a somewhat coherent anti-capitalist message when haute couture brands are beckoning? The implication at the end of Neo Yokio’s first season is that Kaz—and perhaps his equally self-centered buddies, by proxy—will eventually come to terms with his city’s inherent darkness. Literal demons might exist in Neo Yokio, but the city has plenty of its own, given our (very) brief look at the cramped confines of the Long Island Walled Slums district and the treatment of its lower-class citizens. However, given the sluggish, almost nonexistent pace of Neo Yokio’s first run, it’d probably take several seasons to get anywhere promising, no matter how many times Coco Chanel’s memory is blessed. What in the world is Seth MacFarlane’s sci-fi series The Orville supposed to be?